Note: This is a slightly edited version of a story first published by Alternative Media Group's City Hub. With the NSW state election over, the future of the planned WestConnex motorway will become the focus of a huge community campaign over coming months. Lack of funding for public transport, secrecy surrounding the project and its environmental and health impacts will be hot issues in the debate. The Baird LNP government is determined to build the WestConnex. 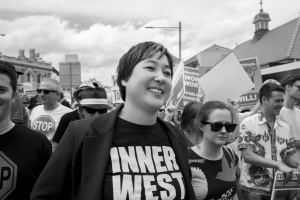 Meanwhile, the Greens, who are opposed to the WestConnex, strengthened their position in inner Sydney with the re-election of Balmain MP Jamie Parker and an easy victory for Jenny Leong in the new seat of Newtown. Greens transport spokesperson and environmental engineer Mehreen Faruqi, who has been a key opponent of the plan, was also elected in the Upper House. The party has already declared its determination to campaign for more public transport and fully support communities opposing WestConnex. So far, WestConnex campaigns have focused on St Peters where the Baird government has resumed more than 40 homes and plans to build a massive interchange on an asbestos-contaminated dump, and the inner west suburbs of Ashfield, Petersham and Annandale that will be affected by the M4 extensions. 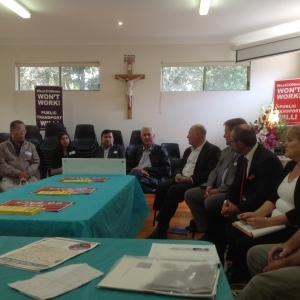 But just three days before the state election on March 28, an unusual forum was held in a Catholic Church Hall on Underwood Road in a quiet part of Homebush just near the site of a proposed 7 kilometre tunnel to Haberfield. The purpose of the meeting was to form a new coalition that will focus on threats to air quality and health of communities affected by the WestConnex and a 9 kilometre NorthConnex tunnel linking the M1 and M2 motorways on Sydney's North Shore. Both projects have unfiltered emission stacks. The group included Greens’ Mehreen Faruqi, two Labor candidates from North Shore electorates, Public Health Association President Jude Page, members of Doctors against Pollution, local campaign groups and residents – some of whom will lose their houses if the M4 extension goes ahead. Residents and health professional meeting in Our Lady of the Assumption hall at Homebush to discuss health impacts of proposed tollways. 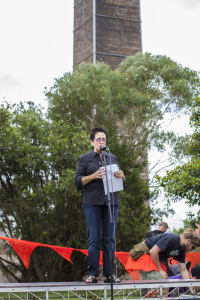 The forum was hosted by Aurelia Roper-Tyler whose family’s life has already been badly disrupted by the early stages of WestConnex. While adjacent houses in her street have been compulsorily acquired, her home has so far been left marooned close to both the M4 and Parramatta Road and a possible smoke stack. Other properties close by have been purchased by a developer who will build apartments close to the motorway. The environmental and health impacts of the M4 widening have received little publicity and are only just beginning to be understood. Even the WestConnex Delivery Authority’s own data shows that Parramatta Road will be more congested after tolls are reimposed on the M4. Ms Roper-Tyler told City Hub she had first learned that she would be affected by WestConnex from her local paper and that WestConnex Delivery Authority have failed to properly inform her about its plans and their impact on her neighbourhood. She said that her whole family had been traumatised by the events. The forum focussed on the long term impact on the air quality near the motorways and its impact on the health of residents. Research shows that increased pollution levels will lead to increased rates of asthma and other respiratory illnesses as well as the development of cancers. She said that based on the “dodgy figures” from tollway company Transurban’s own impact statement, two NorthConnex emissions stacks would emit 150kg a day of particulate matter onto local communities. 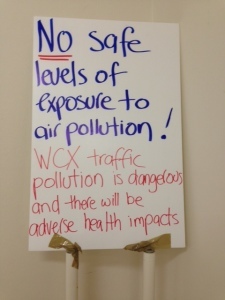 “It costs 5c per car to run a filtration system. Is the community worth 5c? Apparently they’re not”, she said. The Public Health Association has warned that if governments go ahead with poorly planned tollways, Sydney will continue to slip down the world scale of livability due to poor public transport and increasing pollution. “We need governments that put the people before vested interests, with the ability to plan sustainable infrastructure. If governments can’t build infrastructure without damaging the health of local communities they shouldn’t build it. There are safer alternatives,” Ms Page said. “They would involve providing a Health Impact Statement for all major projects and providing a clear and legislated role for input from the NSW Chief Health Officer in planning. Pollution from motor vehicles can be hazardous to people’s health especially if they have asthma or other respiratory disease,” they said. Aside from one short submission from a western Sydney branch of NSW Health, there was no overall evaluation of the M4 widening project from a health perspective. “For instance, the modelling for stage one of the WestConnex, the widening of the M4 that is about to begin was flawed with regard to congestion,” Ms Faruqi said. In answer to a motion put forward by NSW Greens Senator Lee Rhiannon which called for documents about the WestConnex to be tabled in Federal parliament, the Federal Transport Minister Warren Truss refused to release any further information on the grounds of commercial secrecy. The disparate groups and professional associations involved in the new coalition cover huge swathes of Sydney. The Westconnex battle that dominated the election in inner Sydney is certain to get bigger.